This hiking package for individual travellers starts from Genoa, the capital of our region Liguria and ends after 5 days of hiking in Sestri Levante at the eastern end of the beautiful Gulf of Tigullio. The hiking itinerary includes an interesting urban trekking along the coastal promenades of Genoa, a stunning trail through the nature of the regional park of Portofino as well as panoramic trails to sanctuaries with beautiful views to the Ligurian sea. This package can be combined with the hiking itinerary Cinque Terre which starts in Sestri Levante – the destination of this itinerary. As usual the package includes the accommodations in selected small hotels or guesthouses with breakfast and typical dinner, a roadbook with maps and descriptions of the itinerary and the daily luggage transport from one accommodation to the next. The suggested itinerary can by modified by the hikers – all coastal towns have a train station, so it’s easy to shorten the itineraries if needed. Arrival to Genoa by train or flight. Check in to your small city hotel, for example the beautiful small hotel Genova Liberty** or similar accommodation in the city centre. At your arrival you will be given the road book with all the maps and descriptions for your upcoming hike. Enjoy your first dinner with Ligurian specialties in a rustic restaurant not far from your accommodation. – If you have some spare time don’t miss to visit the historic city centre of Genoa with the beautiful buildings of Via Garibaldi – it is an UNESCO world heritage site! We suggest booking an additional night in Genoa to visit the interesting medieval city centre and maybe one of the various museums or exhibitions. The famous large sea water aquarium in the harbour area “Porto Antico” is worth a visit. after breakfast at your hotel start your hiking in the morning towards your next destination – the elegant suburb Genova Nervi. The charming port at Genoa’s east has the most beautiful villas and gardens of the city. This urban trekking leads you along a beautiful seaside promenade and through the picturesque village Genova Boccadasse. Easy and flat hike. The accommodation in Genova Nervi will be organized for example in the beautiful Hotel Esperia***, located in the centre of the village Nervi, close to the beach and the beautiful public gardens. Dinner is served in the hotel’s restaurant. about 4 hours hiking time. Distance about 11 km/total ascent about 95 m asl. Start your hike after a rich breakfast in the hotel. 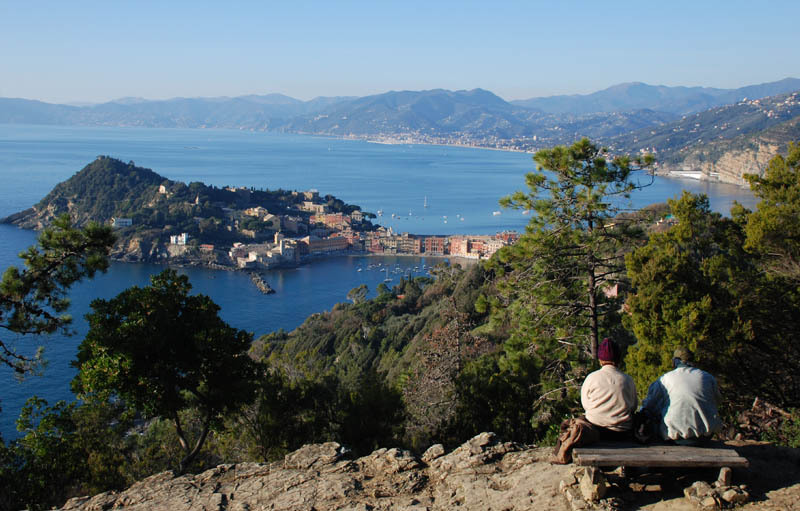 The varied trail leads you to several panoramic points with view over the Golf of Paradise and the Portofino promontory. The suggested itinerary leads through nice hamlets, olive yards and Mediterranean vegetation as well as through the beautiful coastal towns Bogliasco, Sori and Recco – which is famous for the delicious cheese focaccia! The last part of the itinerary follows the coastal road from Recco to Camogli, the charming town where you stay overnight. Accommodation in the small hotel “La Camogliese” or similar and dinner in a typical restaurant. about 6 hours hiking time. Distance about 16.5 km/total ascent about 820 m asl. Today you will hike through the beautiful natural park of Portofino. After breakfast and a stroll along the promenade of Camogli a long staircase leads you to the hamlet San Rocco with great view over the Gulf of Paradise. Then you follow a varied trail over the Portofino promontory, first through shady woods and later immersed in the Mediterranean shrubland until you reach the famous and elegant village Portofino. From Portofino follow the 8 km seaside promenade to Santa Margherita Ligure and to Rapallo. If needed you can shorten the walk and take a public bus. Overnight stay in a small hotel in the centre of Rapallo, for example “Casa per ferie Emiliani” which offers dinner, too. About 6 hours hiking time. Distance about 17 km/ total ascent about 600 m asl. From Rapallo climb up to the sanctuary Madonna di Montallegro situated 612 m above sea level. You can choose to take the famous cable railway the reach the sanctuary. From there start an interesting hike off the beaten paths to Chiavari, overlooking the sea on one side and the high mountains of the Appenine on the other. Don’t miss to visit the historical centre of Chiavari with its characteristics arcades. Your accommodation for tonight will be a nice hotel in the city centre, for example the hotel “Monte Rosa”, which has a restaurant, too. with cable railway: About 3 hours hiking time. Distance about 10 km/ just descent: about 700 m asl. Without cable railway: About 5 hours hiking time. Distance about 14 km/ total ascent about 700 m asl. of the Entella river. Then the trails climbs up the church Santa Giulia on a hill with a beautify panorama over the Gulf of Tigullio. The itinerary leads you then down to Cavi and via the rocks of Santa Anna down to the sea side promenade of Sestri Levante. The charming town centre is found on a tongue of land, between two beautiful bays – the Baia delle Favole and the Baia del Silenzio. After a visit of the centre the most beautiful part of the trail awaits you: follow the trail up to the promontory of Punta Manara, an amazing view point above the cliffs. From Punta Manara a nice trail of about 1 hours ends in proximity of your last accommodation: the agritourism “Pergola dei Paggi”, which offers a delicious dinner with homemade ingredients. About 6 hours hiking time. Distance about 15 km/ total ascent about 550 m asl. after breakfast check out and end of tour. … or decide to continue your hike with our self guided Cinque Terre package! Included services: accommodation for a total of 6 nights in guesthouses, agritourism or 2/3* hotels as by description or similar in double room with private bathroom and breakfast. 6 dinners in the guesthouse/hotel or in a typical restaurant (usually the dinner consists of 3 courses – first course, main course, dessert – drinks are not included), luggage transport every day from one accommodation to the next. Maps, roadbook and description of the hikes. Local emergency assistance (phone number to call). City tax: In some places there is a city tax to pay. This tax is local and subject of frequent changes. It has to be paid cash upon arrival and is not included in this package. However, its cost in our area is never more than Euro 2,00 per person and night. Availability: Please take note that this service is always on request. No allotment has been blocked yet and availability will be checked at the moment of the request. The offered hotels/guesthouses are small and popular family run places. Thus, program changes can be possible as well as alternative accommodation in case of booked out spaces.